Denel Land Systems is reportedly negotiating to sell T5-52 self-propelled howitzers (SPH) to an Asian country (source: IHS Jane’s Defence Weekly). Denel did not disclose the country, quantity, or scope of the contract, but there is a case to be made that this country could be Pakistan, which had tested the T5-52 SPH in 2016. The Denel T5-52 is a 52-calibre, 155 mm SPH. It is mounted on an 8×8 wheeled truck, with the standard system being the Czech-origin Tatra T815 truck with a 265-kW diesel engine. According to Denel Land Systems, the T5-52 SPH has a top speed of 85 km/h and can travel up to a range of 600 km without the need to refuel. The howitzer gun itself, which appears to be the Denel G6-52, can fire base bleed shells to a range of up to 42.5 km. 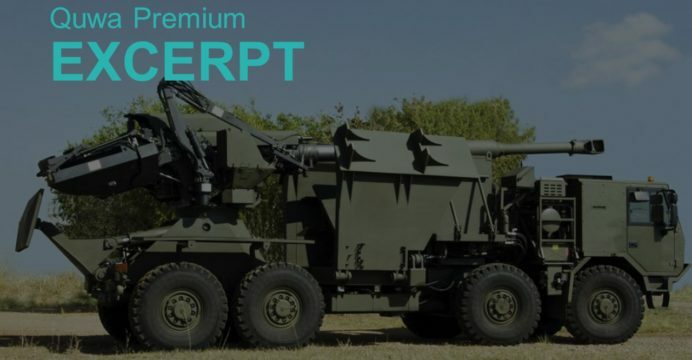 However, if equipped with Rheinmetall Denel Munition’s (RDM) M2005 Velocity Enhanced Artillery Projectile (VLAP), the T5-52 could potentially fire up to a range of 54 km at sea-level. With a crew of four personnel, the T5-52 can brought into action (or withdrawn) within 60 seconds. The T5-52 needs two of its personnel to manage and re-load the ammunition. In terms of payload, the T5-52 can carry 27 projectiles alongside 26 charges. In addition, the SPH has a command-and-control system with automatic laying and navigation system, muzzle velocity radar, gun management computer, and communications suite. Is Pakistan the Potential Buyer? There are multiple indicators that the undisclosed prospect is Pakistan. The most recent of these signs was the fact that the Pakistan Army (PA) Chief of Army Staff (COAS), General Qamar Javed Bajwa, made an official visit to South Africa in January. According to Defence Web, the Chief of the South African Army, Lt. General Lindile Yam, stated that Pakistan and South Africa are engaging in “exploratory discussions relating to artillery.” Likewise, Bajwa had reportedly told South African media that the two sides were negotiating about artillery. Prior to this, the PA had tested the Denel T5-52 in 2016. During the 2016 edition of Pakistan’s biennially-held defence exhibition, the International Defence Exhibition and Seminar (IDEAS), Denel had even displayed a T5-52 SPH unit. Interestingly, according to the source that IHS Jane’s cited, trials had ‘recently’ occurred in Pakistan. It is not clear if these trials are those from 2016 or more recent, but if the former, it could indicate momentum in the PA’s SPH plans. In recent years, the PA undertook a series of acquisitions aimed at improving its artillery capabilities. According to the Stockholm International Peace Research Institute (SIPRI), the PA procured 120 second-hand M109L tracked SPH. The M109L is a 155 mm system.